With the alpine ski season now well under way, we thought it fitting to give you a heads up on the latest high altitude styles. But with skiing and snowboarding attracting such a number of wildly different age groups and personalities, it’s difficult to prescribe one particular style solution. Not only are the alpine tribes very different, but so too are the resorts and their individual official or unofficial dress codes – all of which makes choosing what to pack for a ski holiday that little bit more difficult. With that in mind, we’ve focused on the cross-generational classics – the true cornerstones of any solid après wardrobe – to ensure you navigate the style slalom effortlessly. One thing’s for sure: on the slopes, skiwear continues to be defined by technological know-how with brands like Arc’teryx, Canada Goose, Kjus, and Rab constantly innovating to produce high tech fabrics and construction techniques. Off the pistes, meanwhile, a more obviously athletic version of sports luxe is the name of the game. Labels like Moncler, Fendi and Lacroix (not Christian), plus a host of relatively new and unknown brands such as Bogner and Zai, are creating collections that fuse leisurewear staples with luxurious design details and finishes. For utility and style, you’d be hard-pressed to beat the parka as your go-to choice for an après jacket this season. The silhouette has been hugely popular with fashion brands this year, with the likes of Louis Vuitton and Ports 1961 dressing the parka up with distinction – think tailored, woollen styles, rather than bulky masses of nylon and performance fabrics. These luxe designs might be your preferred option if you’re networking in Zermatt, but for the rest of us – who are more likely to face-plant into the snow from too much glöhwein – technically engineered parkas are a much better bet. From a purely functional perspective, Canada Goose make some of the best on the market, including the iconic Expedition Parka – the undisputed poster boy of the collection. But while the brand scores highly for utility, it can sometimes fall down when it comes to variety of designs. 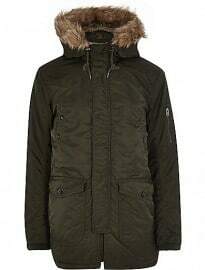 For those that desire exclusivity, lesser-known German brand Bogner offer a range of stylised down-filled parkas with coyote-trim hoods that are practical and stylishly on point. Finally, if you’re searching for a slightly more tailored silhouette and considered detailing, try Woolrich’s Arctic parkas, which are slim-fitting and made from Teflon-coated cotton. Their patch pockets give them a formal edge, which is always a winner at exclusive resorts. What’s more, this dressier style is particularly versatile, so you can easily style it up with a pair of smart chinos/trousers or work a more casual edge with selvedge denim. 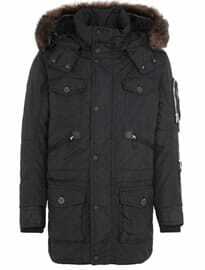 Key Brands: Penfield, Schott, Moncler, Bogner, Woolrich, Nigel Cabourn, Canada Goose, Private White V.C. Quilted and down jackets have seen their popularity soar over the last decade or so, mainly due to fabric and down innovation making them extremely lightweight and virtually impenetrable by the elements. As a result, an increasing number of luxury labels are getting in on the act. 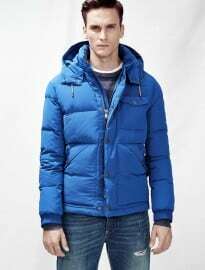 For example, Moncler now produce a broad collection of quilted styles, from its classic goose-down roll neck zipped and hooded jackets to coats with four-point collars and leather and wool detailing. All of these can be easily teamed with a pair of slim- or straight-fit jeans and look equally slick back in the city, which might make the £700+ outlay that little bit easier to swallow. Elsewhere, brands such as Belstaff, who hang their hat on their outerwear heritage, have produced a number of extremely luxurious down jackets for autumn/winter 2015, while Dolce & Gabbana are offering a ribbed velvet quilted jacket that nicely invokes a more traditional mountain man vibe. On the high street, Uniqlo are the leaders when it comes to affordable down jackets, with their Ultra Light Down range coming highly recommended by industry experts and consumers alike. Available in a wide range of colours and with price points ranging between £59.99 – £79.90, they really are a no-brainer. Remember: if you want to be able to wear them off the mountain, go for dark colours rather than Day-Glo – but you knew that already. Alpine knitwear has traditionally lent towards genuine comedy rather than bona fide style, but there are certain après-ski designs that deserve a place in your wardrobe. Despite the merino wool base layer’s obvious beneficial moisture-wicking and temperature regulating properties, there are few things more classically masculine than a simple ribbed or waffle knit. In the mountains, these designs offer a slim-fitting, torso-enhancing athletic look that heavyweight cable and Aran knit jumpers fail to provide. They are also much less bulky, which aids manoeuvrability and makes wearing them with a parka or down jacket that little bit less stifling. 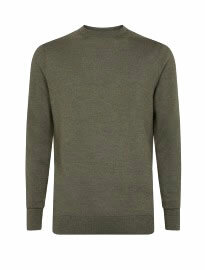 For the most flattering styles, John Smedley should be your first port of call. The brand produces a huge array of ribbed cashmere, wool and silk blends that are cut to follow the contours of your body, while both Lanvin and Richard James offer slightly chunkier ribs that would work well as both a standalone piece or insulating middle layer. Elsewhere, respected Scandinavian brands such as NN.07, Our Legacy, Norse Projects and Wood Wood all know a thing or two about cold-weather knitwear, producing a wide range of high quality, affordable options season after season. When you’re not wearing ski boots on the slopes, you’re almost certainly wearing hiking (or vulcanised rubber) boots. While hiking boots haven’t historically been associated with even the remotest tenets of style, in recent years they’ve developed a bit of a cult following due to brands like Diemme repositioning the silhouette as a contemporary, urban staple. In fact, Diemme’s Roccia Vet boots in full-grain waterproof leather wipe the floor with most other models on the market, and – being handmade in Italy – boast that sense of luxury too. Although you may not think it, hiking boots are extremely versatile and will slot seamlessly into most casual or smart-casual looks – whether you’re in the mountains or not. If you were considering shelling out for a pair of duck boots, remember that hiking boots are a stylish, on-trend alternative that you will get much more wear out of in everyday life. If you look after them and invest in quality (see the brand list below), you’ve got yourself a hard-working, durable boot that will see you through plenty more winters (and skiing holidays) to come. Parka? Check. Down jacket? Check. Ribbed knits? Check. Hiking boots? Check. It’d be tempting to just throw on a pair of your favourite Levi’s and be done with it, right? Indeed, there would be nothing wrong with doing exactly that, except that’s what the rest of the resort is doing and stylish men are more wolves than sheep. So, what are your options when you’re giving denim the night off? Flannel trousers make an excellent alternative when trying to pull off a slightly smarter look. They’ll still tuck into a pair of hiking boots and combine well with a ribbed roll neck or slightly chunkier waffle knit jumper. Most menswear brands offer wool trousers these days, particularly the luxury ones, but for value and style J.Crew punches above its weight. If the flannel look is a little too formal for you, opt for a heavyweight cotton twill chino instead, with J.Crew again being a good brand for slim-fit styles in a variety of modern shades. For a more texture rich alternative, cords come highly recommended, particularly in colder resorts. French brand A.P.C. are always good for slim-fitting corduroy trousers (check out its Petit Standard model), while low cost versions can be found everywhere from John Lewis and M&S to Topman and Mango Man these days. Wherever you go skiing this season, you’ll need to factor in functionality, practicality and style to look good once you’re off the slopes. The parka, combined with a ribbed knit, wool trousers and a pair of quality hiking boots strikes the perfect balance between alpine-appropriate and contemporary trends – all while saving you from shelling out on après-specific clothing. Remember to pack these five après-ski essentials and you’ll never go off-piste.